The U.S. Navy officially approved the start of detailed design and engineering work on its new class of SSBNs. The Columbia-class ballistic missile submarine (SSBN) program, formerly known as the Ohio-class Replacement Program, is officially entering the next stage in the long and drawn out Department of Defense acquisition process by passing a so-called Milestone B review on January 4, USNI News reports. That means U.S. shipbuilder General Dynamics Electric Boat can now commence detailed design and engineering work on what is slated to become the U.S. Navy’s priciest and at the same time deadliest ballistic missile submarine class in its history. The Milestone B review was originally scheduled for August 2016, but had to be pushed back due to price, design, and production readiness concerns by the Pentagon. According to USNI News, Frank Kendall, the undersecretary of defense for acquisition, technology and logistics (AT&L), signed an acquisition decision memorandum (ADM), outlining total cost and the production schedule of the program, “and approved the program for Milestone B, as well as designated it a major defense acquisition program,” earlier in the week. In December, U.S. lawmakers also appropriated funds for the next stage of the Columbia-class program in the 2017 defense budget. 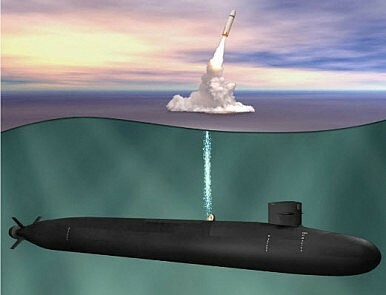 General Dynamics’ Electric Boat Division also built the U.S. Navy’s current sea leg of the United States nuclear triad, the Ohio-class SSBN, which entered service in 1981 with the last submarine of the class commissioned in 1997. The U.S. Navy is currently operating 14 Ohio-class SSBNs, armed with up to 24 Trident II D-5 submarine-launched ballistic missiles fitted with multiple independently targetable reentry vehicles. As I noted last month, in December 2016 the U.S. Navy announced that the lead boat of the U.S. Navy’s new SSBN class will be named USS Columbia (SSBN 826) in honor of the District of Columbia (See: “US Navy’s Deadly New Nuclear Sub Finally Has a Name”). The new Columbia-class will begin replacing the Ohio-class in 2031. The new subs will be designed for a 42-year service life all the way through 2085. According to the United States Naval Institute, the new sub will displace 20,810 tons when submerged — the largest submarine the U.S. Navy has ever constructed — measure 561 feet (171 meters) in lengths, and have a beam of 43 feet (13 meters). This will make the new class only marginally larger than the Ohio-class with 18,750 tons submerged, 560 feet (170 meters) in lengths, and a beam of 42 feet (13 meters). With a complement of 155, the crew size will also be roughly the same on both ships. The lead ship of the class is expected to cost $14.5 billion, which includes $5.7 billion in detailed design and nonrecurring engineering costs, and $8.8 billion in construction costs for the boat itself. The remaining 11 subs are estimated to cost around $8 billion in 2017 dollars. Some analysts expect the total number of Columbia-class SSBNs to go down from 12 to ten due to the high price tag. Total lifetime cost for the U.S. Navy's new class of ballistic missile subs will be around $100 billion, the US Navy secretary said this week.